Val McDermid's Tony Hill and Carol Jordan novels are thrillers at their best--unbearably suspenseful, psychologically complex, expertly plotted and impossible to predict--and they have riveted millions worldwide. As Cross and Burn opens, Tony and Carol are facing the biggest challenge of their professional lives: how to live without each other. No one has seen Carol in three months, and without her, the police brass no longer want Tony's services. Even more damaging is the fact that they both hold Tony responsible for the bloody havoc their last case wreaked on Carol's life and family, and Carol has sworn she'll never speak to Tony again. But just because Tony and Carol's relationship is finished doesn't mean the killing is. A body has been discovered in an abandoned flat inhabited by squatters. As connections to other missing or dead women emerge, a horrifying pattern becomes clear: someone is killing women, all of whom bear a striking resemblance to Carol Jordan. And when the evidence begins to point in a disturbing and unexpected direction, thinking the unthinkable seems the only possible answer. 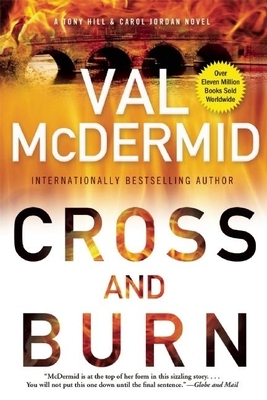 Val McDermid is the best-selling author of twenty-six previous novels, which have been translated into over forty languages and have sold over ten million copies worldwide.